Did you know that there is a robust carving tradition in the Orthodox Church? Bobby Maddex talks with Jonathan Pageau, a wood carver in the Orthodox tradition and the editor of the Orthodox Arts Journal. Bobby Maddex interviews Kenneth Kidd, the Annual Gifts Officer for the Orthodox Christian Mission Center (OCMC), about OCMC's Agape Canister Program. Mr. Bobby Maddex: This is Ancient Faith Presents. I’m Bobby Maddex, Operations Manager of Ancient Faith Radio, and today I will be speaking with Jonathan Pageau. 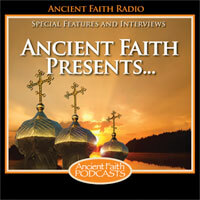 He is a woodcarver and the editor of the Orthodox Arts Journal. Welcome, Jonathan. Mr. Jonathan Pageau: Thanks. It’s good to be here. Mr. Maddex: Tell me about yourself. Have you always been Orthodox? Tell me about your personal history with the Church. Mr. Pageau: I grew up Evangelical, and a bit after college I had a bit of a faith crisis and started to look into it. I also studied in art, so all those things together slowly brought me to Orthodoxy, through the icons and Orthodox art. Mr. Maddex: And then how did you start carving? Mr. Pageau: When I was a catechumen, I wanted to paint icons desperately. You can’t really do that without training, but I had a piece of wood and a knife, so I tried something. I tried a blessing cross, and it looked okay. Then I did a more complex icon, and then it looked better. So I showed it to my priest and he said, “That’s really good. Keep going.” So I studied iconology here with Fr. Steven Bigham, who’s in Quebec, so I learned the theory of icons, and then the carving I kind of figured out on my own. Mr. Maddex: Really? So you just started out of the blue? You weren’t trained at all as a carver? Mr. Pageau: No, I trained in art. I trained in painting. I spent several years before I became Orthodox, I spent so much time looking at carved ivories and looking at medieval carving, Western medieval carving. I had kind of internalized the visual language, so when I did it… One of the first icons I carved I still have today and still have on the website, I still use. I felt like it was just something I had inside me. Mr. Maddex: Great. I’m going to want to talk about those carved icons in a second here. But is there a tradition of carving in the Orthodox Church? If so, I don’t really know much about it. Mr. Pageau: Yes, there is definitely a tradition of carving in the Orthodox Church. Some of the first images we have in Christian art are carvings, or sarcophogi, carvings of Christ and the Apostles on the sarcophoguses. Then there continually was a tradition of carving. If you look at [the] sixth century, Justinian’s time, there’s a whole lot of ivory carving. Then when after the iconoclastic controversy continues on that way… It’s only actually quite recently in the 16th, 17th, 18th century when you started to feel that clash between the West and the East, where it started to intensify that some Orthodox thinkers positioned themselves against carving. There is actually an interesting statement by Peter the Great which is kind of like the last call for carving, where he said that carving should not be used in churches, so they were all burned. But the reason why he said they shouldn’t be used in churches was because he didn’t like the quality of them, so it’s actually quite ironic that the reason why he wanted them to be burned was, if we know Peter the Great, they weren’t Western enough for him, actually. And he was introducing all this Western art into the Church, and then he couldn’t find carvers that suited him. So there’s this strange kind of back-and-forth, especially toward the later time, [of] people fighting the carving. Most recently, this art is being rediscovered in Russia, in Greece. In the last maybe 30 years, it’s being revived by some great artists in Russia, and people are rediscovering those old ivories. A lot of the Russian carving, there was so much beautiful Russian carving being done up to the 17th, 18th century, and those things are starting to be rediscovered again. Mr. Maddex: When I first heard that you carved icons, I couldn’t picture in my mind what that would be like. Can you describe that for our listeners, so they get an idea of what a carved icon looks like? Mr. Pageau: Really, in the Orthodox tradition, most of the carved icons, they would look essentially as a painted icon would, in the sense that the same types are respected, the same compositions. It’s only that, instead of painting the drawing, you basically will carve the icon, and then, using different levels, you create the shadows of the folds and the shadows of the face. So if you look at a good carved icon, you’ll get the exact same composition as you would in a painted one; it’s only that it’s shadows. It was mostly used in book covers, with ivories. You would see it on chalices, not necessarily carved in wood but in relief icons, on bells or on chalices, anything that wouldn’t handle a painted surface. There’s also some carving that was done on the outside of churches in some Orthodox [places], not a lot, but there is some stone carving that was done on the outside of churches. If you haven’t seen it, think of what you’ve seen maybe on a chalice. It would look like that, but in wood or stone or in ivory. Mr. Maddex: Can a carved icon serve the same purpose as a painted one? Can you venerate a carved icon? Mr. Pageau: Yeah, the kind of hostility that came to carved images, like I said, [was] quite late in the history of Orthodoxy. Carved images were used very much to be venerated. They were prized as travel icons, mostly, because they were durable. For example, Russians who would go on certain pilgrimages would sometimes carry these small relief icons with them so that the surface wouldn’t scratch. In the tenth century, they were quite popular for royal families. You’d have these beautiful carved ivory icons that were folded up and you could carry around and venerate for your own personal use. Mr. Maddex: In addition to carved icons, what are some of the other things that you carve for churches and Orthodox Christian homes? Mr. Pageau: Yes, I mean I carve mostly icons, but I also use icon-carving to create other objects. Like, I’ve created some wedding crowns, some furniture with carved icons on it. I make pectoral crosses. I make panagias for bishops. Anything that would necessitate a carved image that needs to be lugged around, that is something I would do. But also just regular icons for people to have in their homes and to venerate. It’s the difference between, maybe, an iconostasis-carver who carves mostly patterns; I really carve images. Mr. Maddex: And I noticed that you do carve some statuary as well, which you don’t often see in Orthodox churches. What is the Church’s stance on statuary? Mr. Pageau: There is no official stance on statuary in the Orthodox Church. There is also statuary in the Orthodox Church. It is a marginal use. There isn’t a lot of it. So you usually when I will carve statuary, it’s mostly for Catholic patrons, who want statuary. Then what I will do is I will use medieval-style statuary and go back, try to capture the iconographic feeling that you find in an icon and then apply it to a statue, so it looks more like medieval statuary. If an Orthodox patron asked me for a statue, I would try to find out why they want this, first. I mean, like I said, I don’t think there’s a moral objection to them; it’s just not something that’s usual. I tend to want to encourage traditional practices, so I would just try to figure out why you want a statue more than anything. But there are some traditions… For example, there’s a Russian tradition to represent St. Nicholas of Mozhaisk almost exclusively in a statue, and also St. Nil Stolbenskii, who’s represented almost exclusively as a statue. So there’s at least two saints that, even in Russia, until the 20th century, were represented exclusively as statues. Mr. Maddex: What do you enjoy most carving? Is it the icons? Mr. Pageau: Yes, the thing I enjoy most carving is icons in stone. One of the things that I’ve been working on is reviving a type of carving that was done in Constantinople up to the fall of Constantinople, which is icons in steatite. It’s a type of stone that can handle a lot of detail, so I can make small, small pectoral crosses, very detailed. It’s a way to replace ivory, really, because we don’t have access to ivory any more. I can make these very, very miniature images in this stone, and it’s wonderful to work with; it’s a pleasure. Mr. Maddex: How can listeners see your carvings and perhaps even purchase some? Mr. Pageau: I have a website, Pageau Carvings; people can look that up. Or also, I’m also on Facebook, same thing: Pageau Carvings. I’m there. Pageau is complicated to write. It’s P-a-g-e-a-u. It’s a French name. Mr. Maddex: All right. Well, let’s move ahead and talk a little bit now about the Orthodox Arts Journal. When was that started and what is its purpose? Mr. Pageau: The Orthodox Arts Journal was started about a year and a half ago by Andrew Gould. Andrew Gould is a building designer and liturgical artist in South Carolina. We had talked about it for a while, and the opportunity came up to set up this journal, which is a way to encourage Orthodox arts, mostly in America; we also have some British contributors, but it’s for Orthodox people to get a sense of the beauty and the importance of authentic liturgical art. There’s obviously, because of modernism and industrial practice, there’s a tendency of people to buy liturgical art that’s mass-produced and is sometimes quite cheap. We’re trying to encourage our liturgical artists here in America, and also the sense for churches to see the sense of having beautiful things for the glory of God. Mr. Maddex: Why don’t you tell me about some of your contributors and the kind of articles that they submit to the journal? Mr. Pageau: I would say that we have a few sections in the journal, a few ways we have some that it’s just news, different events, shows, concerts that are happening in America or maybe in Europe that would be interesting to our readers. That’s one thing that we have. Another part is showcasing good art, showcasing artists that are doing beautiful things. For example, we have several artists. We have someone from England; his name is Aidan Hart. He’s one of the greatest iconographers there. There’s a priest, Fr. Silouan Justiniano, who writes. Showcasing the art… There’s a part that’s also explaining the theory of art, the theological background, why it’s important. So we’ll have articles that will explain some of the symbolism in icons. Sometimes symbolism, for example, of architecture, the different meanings that we find, what the backgrounds are. It’s quite a wide reach of what we’re doing. We also have musicians who are writing about music. We have Richard Barrett, who runs the St. John Damascene Society. We have Vladimir Morosan. People who are quite prominent in the Orthodox art world, I would say. We have a wide reach of what we’re trying to do. Mr. Maddex: Would you say that the information for the most part is accessible to a general audience? Mr. Pageau: I think there’s a mix. I think most of the articles are quite accessible to a general audience, and I think there are a few articles that are more theory-minded, more difficult to read, but I think a person can find their way through the journal. Most of the articles, we have a lot of pictures, obviously mostly pictures of different things. I think people can find their own there. Mr. Maddex: And what is the web address for the journal? Mr. Maddex: OrthodoxArts—a-r-t-s—Journal.org. Jonathan, is there anything else you’d like to add before I let you go today? Mr. Pageau: I would just encourage people to visit the journal and to see some of the great things that are being made here in North America and Europe and Russia and Greece, and to participate in bringing Orthodox arts to America. It’s also a great way to witness to the people around us when they see the beauty of our churches and they see the beauty of the icon and have the iconostasis and everything. It helps people to see the importance of glorifying God. Mr. Maddex: Very good. I thank you so much for joining me today, Jonathan. Mr. Pageau: It’s my pleasure. Mr. Maddex: Once again, I have been speaking with Jonathan Pageau, a woodcarver. He’s also the editor of the Orthodox Arts Journal.